At the forefront of human innovation and office seating, Steelcase chairs are highly in tune with your body from the first seat. With a style for every body, your chair will change the way you feel about office seating. Try your Steelcase chair for thirty days -- if you're not completely satisfied, return it for free. 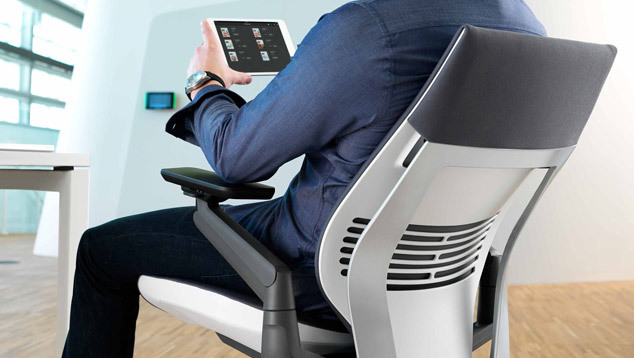 Designed with you in mind, Steelcase ergonomic chairs boast adjustments that put you in control. From 4-way adjusting arms to drafting chairs that go higher, there's a seat waiting that's perfect for you. 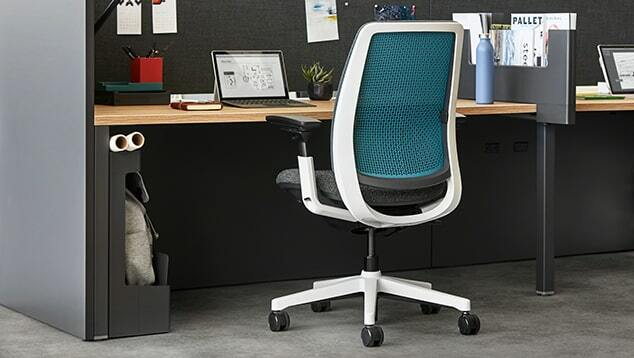 From its intuitive adjustments to exciting Steelcase fabric options, you'll be able to personalize your Gesture, Think, or Amia in more ways than one. Design the chair that suits you and your style. Designed in collaboration with the Steelcase Design Studio and industrial designer Thomas Overthun of IDEO, innovative ergonomic technology is built right into the Amia, quietly providing adjustments without drawing too much attention to itself. Take a seat in the chair and lean back; that comfortable flex you feel is a result of the chair's LiveLumbar technology in its backrest. This unique team of flexors move in tandem with you, and provide dynamic support that's consistent throughout the entire back. Technologically advanced to its core, yet not overwhelming in its features, the Amia is one chair that's ready to supply subtle support when and where it's needed. Times are a-changin'. Made to support you in a wider range of postures, the Gesture Chair is the first ever office chair that fits to you as you engage with your devices, supporting not just your body but your mobile technology, as well. From laptops to tablets, different technologies require new sets of movements; the Gesture is here to give you the flexible adjustability you need to let you comfortably sit and type, swipe, and tap away at your devices. With arms that mimic yours and move 360 degrees, you'll be able to pose yours in pretty much any position, or move them out of the way completely if you need a little extra elbow room. Created with the human spine in mind, the Leap Chair is the smartly-adjusting ergonomic chair that allows you to customize it until it's the perfect fit for you. The Leap boasts a exceptional range of adjustments, from LiveBack technology to upper back force to lower back firmness. Why so much focus on the back? After multiple studies with over two dozen ergonomic scientists, Steelcase found out just how unique the human spine is, with each of our backs moving in completely different ways. Their designers also learned that the upper and lower back need different support and designed the Leap to respond accordingly. Needless to say, this chair is a high-end seating solution that really has your back. Redesigned and re-engineered to provide ideal support in an increasingly mobile world, the Think Chair is able to support all types of work, from focused work to collaborative brainstorming. As its name would suggest, this ergonomic chair from Steelcase offers intuitive adjustments that require less manual readjusting. This means the user saves time throughout the day, and makes the chair ideal for short- and long-term sitting. Adaptive Bolstering in the Leap's seat delivers dynamic support while simultaneously shaping itself to you, adapting to your body as you switch postures. When searching for smart seating, look no further than the Think. Learn more about our Steelcase Free Ship Free Returns Policy. Now's the time to try the Steelcase chair you've had your eye on. Order any Steelcase chair from us and try it out risk-free for thirty days. If you decide you want to return your chair for any reason, you pay no restocking fee and incur no return shipping charge. We'll even send you a pre-paid FedEx shipping label that you can use to return the chair at no cost to you. Although we do love letting customers get to know our chairs in our showroom, this is not sufficient time to see if it's "the one." 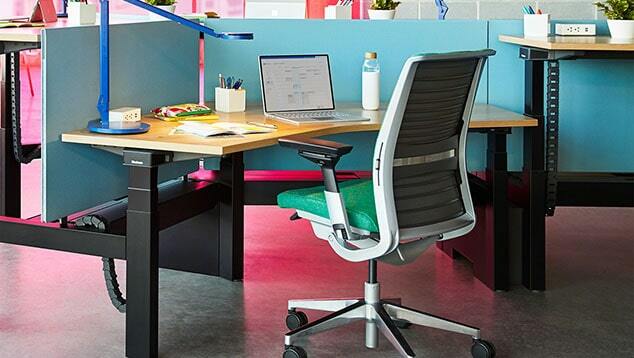 The only way to truly know if an office chair will work for you is to try it out in your usual work environment for at least a few days, which is why we advise ordering a chair from Steelcase and trying it out that way (all Steelcase chairs ship fully assembled). Your thirty day trial period begins on the day that you receive your new chair. If you decide that the desk chair doesn't work for you, give us a call and we'll set up your return. This is no stress, no post-purchase trauma, and no risk shopping. Free Ship, Free Return applies to FedExable products ONLY. Free Ship, Free Return only applies to products with fewer than 30 days of usage. Returns will not be accepted 30+ days from the received date. You'll then send the product back to Steelcase.